JUPITER, FL, February 20, 2014 – The use of antibiotics is often considered among the most important advances in the treatment of human disease. Unfortunately, though, bacteria are finding ways to make a comeback. According to the Centers for Disease Control, more than two million people come down with antibiotic-resistant infections annually, and at least 23,000 die because their treatment can't stop the infection. In addition, the pipeline for new antibiotics has grown dangerously thin. "Now, because we know the resistance mechanism, we can design elements to minimize the emergence of resistance as these promising new drug candidates are developed," said Ben Shen, a TSRI professor who led the study, which was published February 20, 2014 online ahead of print by the Cell Press journal Chemistry & Biology. The antibiotic compounds secreted by Streptomyces platensis, which are called platensimycin and platencin and were discovered only recently, work by interfering with fatty acid synthesis. Fatty acid synthesis is essential for the production of bacterial cell walls and, consequently, the bacteria's existence. Platencin, although structurally similar to platensimycin, inhibits two separate enzymes in fatty acid synthesis instead of one. 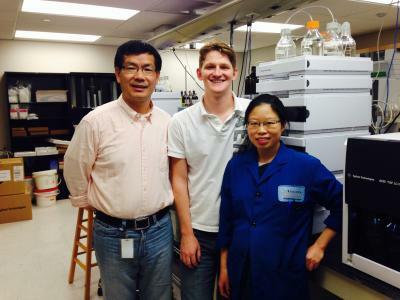 Authors of the new study include (left to right) professor Ben Shen, research associate Jeffrey Rudolf and research associate Tingting Huang of the Scripps Research Institute. "Knowing how these bacteria protect themselves, what the mechanisms of self-resistance of the bacteria are, is important because they could transfer that resistance to other bacteria," said Tingting Huang, a research associate in the Shen laboratory who was first author of the study with Ryan M. Peterson of the University of Wisconsin, Madison. "Understanding how these elements work is a big leap forward," added Jeffrey D. Rudolf, a research associate in the Shen lab who worked on the study. "Now these bacteria have shown us how other bacteria might use this resistance mechanism to bypass fatty acid biosynthesis inhibition."